Here is a board I designed (derivative work from Zach Hokken) that uses the AS5306 austriamicro systems chip. Its still in the beta stages here. But hopefully we will be able to close the loop on the mini cnc (or any other contraptions in the future). Meaning instead of saying take 5 clockwise steps then moving on. You can actually say take 5 steps…. Did you take 5 steps? Yup.. Then move on. 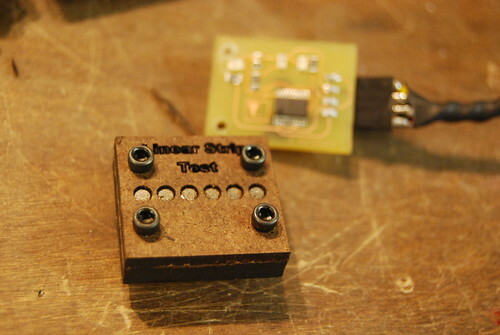 Finalize connectors. Zach's board uses CDROM audio cables. Perhaps we stay with this. Change the BLUE LEDS!!! Wayy to bright. So where would this device take the reading? But there are 4 wires. Ground, VCC, and then your 2 digital read signals. I will post some more info when I create it. For now it was more to see if it could be done. I have been a bit side tracked on some real life "work". So until then I think the video will explain it. If not let me know. Sweet. So would you need to make a strip of magnets along the axes and setup the sensor on the linear motion parts? Or would this be attached to the motor and monitor the internal rotation? I have another magnetic encoder I ordered to do some stuff with rotation. But this one uses magnetic strips (multipole). Here is an attempt at me creating my own multipole strip very cheaply with really strong mini magents. I will post more when I get some initial results. Let me bounce an idea off of you. Could you gut an optical (or laser) mouse for its optical engine, and use that for tracking on the linear motion components? 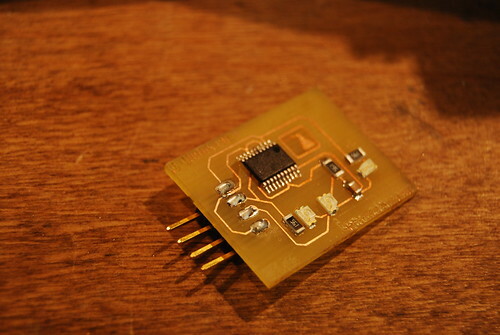 I'm sure it wouldn't be too hard to interface the mouse component with an arduino. I vaguely remember something I read a few years ago about using optical mouse engines on a roomba or some robot to track its own movement. The engine would have to work on aluminum though. You'd probably have to put a strip of tape or something on a strategic position for each axis. Probably would work. If we rely on magnetic fields for accuracy then we dont care about dust and debris. However I have ordered a few linear optical encoders to mess with. For non-cnc applications.. perhaps on additive fabbing. IE makerbot style.